The extended January thaw offered much appreciated respite from this Winter’s frequent bouts of arctic chill. A thaw like that is a double edged sword though it seems. It gives us a break from the emotional and physical clenching that comes with below zero temps, but in that loosening we give up some of the firmness that allows us to maintain our resolve. Sometimes a lull can make us feel like the worst is behind us even when we know better. The eye of a big wind producing storm, the slight lessening of the grade in the middle of a long climb or in this case a long mid-winter thaw all can lead us to let down our mental guard. It is a very human thing to hope though I can only imagine animals do it too. Such hope can be dangerous though if embraced too fully and then found to be false. 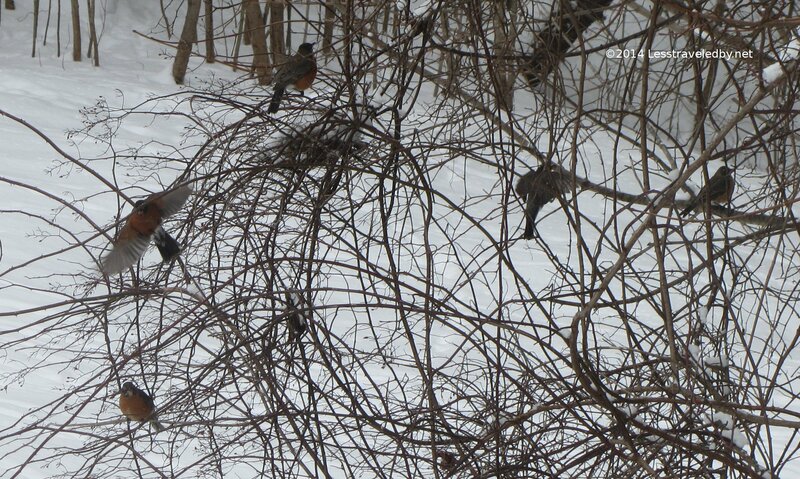 The flock of robins in these pictures appeared near the end of the thaw. Likely following the warm air north they had enough time to get this far before Winter closed back in around them. Now their hope of an early Spring appears to have turned into a resolve not to freeze to death before it gets here. 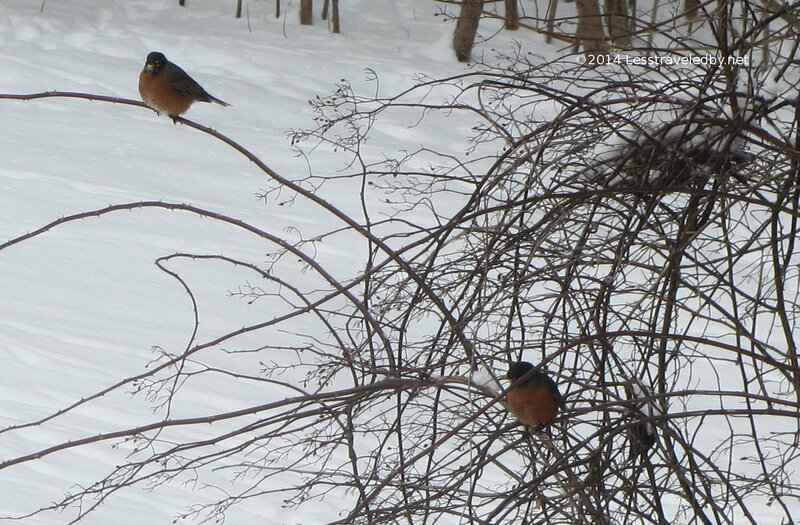 They are in almost constant motion, flitting from branch to branch in effort to keep warm. We people too felt some of that hope of Spring and now perhaps to spite the lingering Winter or perhaps flitting about to keep warm like the robins, activities seem to be on the rise. I am seeing more and more of this year’s thru hikers talking of their plans, finalizing their gear and counting the days until they start their migrations northward. Much like the robins, getting carried away with hope and heading north too early can lead to getting caught in the snow unexpectedly. Even once the snow is gone patience is still something I try to hold on to. The mud season here in Maine is a terrible time to be on trail. No matter how warm the sun or how sweet the air trying to get out there too early can do a lot of damage to the trails. A few days of slick mud trail can do a lot of mental as well as physical damage to us as well. Winter will turn to Spring, snow will turn to mud and eventually the trails will dry out just in time for the black flies to come out…each when they are ready. Our need to hurry them along won’t change them a bit though the stress of it might change us. Better to go with the flow of nature than to try to fight it. Let it be as it is now and enjoy each day of each season for what it is.